Inslee said his proposals, which he called "a clean energy smart deal," would put Washington state on track to meet its goal of reducing greenhouse gas emissions to 25 percent below 1990 levels by 2035. Rebounding from the defeat of a carbon-fee initiative he strongly backed, Gov. Jay Inslee is proposing a suite of state legislation to fight climate change, including a plan to rid electric utilities of fossil fuel-generated power by 2045. 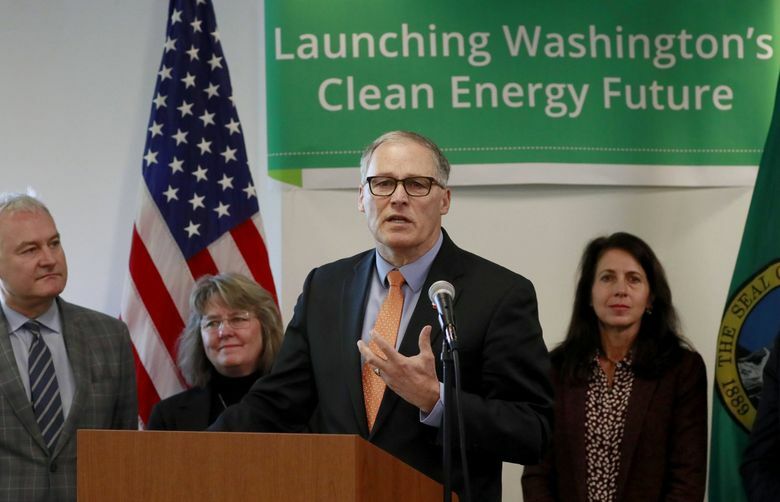 Calling his proposals “a clean energy smart deal” during a news conference Monday in Seattle, Inslee said they would put Washington on track to meet a target in state law of reducing greenhouse-gas emissions 25 percent below 1990 levels by 2035. Other proposals in Inslee’s legislative package include phasing out “super-pollutant” hydrofluorocarbons used in air conditioning, a clean-fuels standard targeting auto emissions, incentives for electric vehicles and increased energy-efficiency regulations for buildings. Compared with previous unsuccessful proposals to put escalating taxes or fees on carbon emissions, Inslee’s latest menu of legislation could prove more palatable to state lawmakers — giving the second-term Democrat a win as he weighs a presidential bid in 2020. Inslee said states like Washington must move forward in the face of inaction from President Donald Trump’s administration. “We know that there is a mighty chorus of people demanding climate action. And we know that we have the responsibility of this more so than ever because, unfortunately, we have climate denial ruling the roost on Pennsylvania Avenue,” said Inslee, flanked by Democratic legislators and environmentalists. In all, the governor’s proposals would spend $268 million in the 2019-21 state budget, according to a summary of the agenda distributed by the governor’s office. Among the largest expenses would be $53 million to convert two state ferries to electric hybrids and $64 million to build two new electric ferries. Under the governor’s plan, the ferries Tacoma and Wenatchee, which each have four diesel engines, would be converted to hybrid power. Two diesel engines would be replaced by batteries, so boats would run on “hybrid” mode, in which fossil fuels can help recharge the batteries. Joan Crooks, CEO of the Washington Environmental Council, praised Inslee’s agenda, saying it steps up to the threat of climate change as painted in a recent federal scientific report, which predicts rising temperatures will severely harm the Pacific Northwest’s ski industry, salmon runs and fruit orchards in addition to bringing additional floods and severe forest fires. “Do we want to be the grown-ups who did something to change the destructive course we are on, or are we going to be the ones who let it happen?” Crooks said. The proposals were criticized by State Sen. Doug Ericksen, R-Ferndale, who pointed to the November election results in which 57 percent of voters rejected Initiative 1631, the Inslee-backed measure that sought to impose a fee on fossil-fuel emissions, raising $1 billion a year by 2023 to fund clean-energy projects and other programs. I-1631 drew $30 million in opposition spending, largely from the oil industry. Inslee and his aides had no immediate estimate of the total cost of his proposals to consumers who might see higher energy costs. He said the costs of inaction would be greater, pointing to a recent study co-authored by University of Washington scientists, which compared the world’s current warming pattern to a greater warming trend 252 million years ago that led to mass extinctions. “We are a lot smarter than the dinosaurs. They were a great species. My grandchildren love them. But we were given cranial capacity for a reason,” Inslee said. Inslee has been a self-described climate hawk dating back to his time in Congress, when he co-authored a book, “Apollo’s Fire,” heralding a green revolution that could create new jobs while fighting climate change. But facing a divided Legislature with narrow Democratic majorities and Republicans sometimes in control of the state Senate, Inslee’s most ambitious proposals for a carbon tax or California-like cap-and-trade program have not gained traction. Inslee and his environmentalist allies are banking on a different reception when the 2019 Legislature convenes next month. After picking up several legislative seats in the recent election, Democrats will enter the session with their strongest majorities in recent years, with a seven-vote margin in the state senate and 16-vote lead in the state house. While saying the latest proposals would make Washington a leader in clean energy, Inslee acknowledged that his plans also are following the lead of similar programs already in effect in other states, including California. Earlier this year, California Gov. Jerry Brown signed legislation to obtain all of the state’s electricity from carbon-free sources of power by 2045, and Xcel, a major utility operator, earlier this month announced it would reduce carbon emissions to zero by 2050. While his aides said Inslee’s latest climate plan will put the state on pace to meet its 2035 emission-reduction goals, it would not kick in fast enough to meet the state’s interim 2020 targets. It also falls short of more ambitious targets scientists say are needed to stop global temperatures from rising to destructive levels. Inslee’s record on carbon pricing was criticized by Yoram Bauman, an economist who sponsored an unsuccessful carbon-tax initiative in 2016 — one that was opposed by Inslee and many environmentalists. “By helping to defeat a centrist, revenue-neutral carbon tax effort in 2016 (I-732) and then backing a disastrous ‘Green New Deal’ proposal in 2018 (I-1631), Governor Inslee may have poisoned the well when it comes to putting a price on carbon,” Bauman said in an email Monday. Bauman pointed to an “irony” that segments of the business community are starting to come around on carbon pricing even as Inslee is backing away. Officials of BP, which operate the state’s largest refinery, have repeatedly said that they opposed the structure of I-1631 but do want carbon pricing and would work with politicians in Olympia in 2019 to come up with new legislation. Inslee said he’s not ruling out another carbon tax or fee in the future. But he said his current plan would still be a giant step. “It’s like asking Neil Armstrong why did you only go to the moon … We’re going to the moon this year with this package. That’s the reason this package was developed this way, so that it can pass this year,” he said. Correction: the ferries Tacoma and Wenatchee would be converted to hybrid electric under Gov. Inslee’s proposal. An earlier version of this story misidentified one of the ferries. Seattle Times reporters Hal Bernton and Mike Lindblom contributed to this report.